This is a continuation of our posts about the birth of Wood for Haiti, a new nonprofit that is seeking to rebuild Haiti and restore western forests at the same time. Lodgepole, along with ponderosa pine, is the tree of choice for the mountain pine beetle. The mountain pine beetle is a native species that periodically infests large forest acreages when the right combination of weather and forest conditions (often related to an absence of active forest management) combine to promote a surge in the beetle population. “We view harvesting of beetle-killed wood as beneficial,” continues Ziesak. “One reason is that lodgepole is a relatively short-lived species - about 100 years - and when the forest floor receives sunshine, there are plenty of lodgepole seeds that will sprout immediately. In addition, in stands of dead lodgepole, the trees rot and fall over after 5 to 7 years, creating a jack-strawed mess of fallen trees that creates a significant fire hazard as well as something that is extremely difficult for man or beast to walk through.” The state of Montana leaves 5 to 15 tons of woody debris on the ground when harvesting, which they deem sufficient for supplying nutrients for regeneration. These jack-strawed stands may have 100 tons or more per acre of downed material. Wood for Haiti is interested in harvesting beetle killed wood from any source: private or public lands. However, because landowners prefer the aesthetic of green trees or fear the fire hazard of all that dead wood, they have been harvesting at a high rate. The substantial majority of remaining standing dead timber is on public land, particularly on national forests. “Here in Montana, there are about five million acres of beetle-killed timber that could be available for utilization. Much of it is on public land, and it presents a tremendous opportunity for an initiative such as Wood for Haiti, provided we can get the trees to the mill,” said Ziesak. 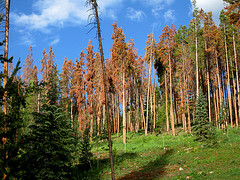 The current outbreak of mountain pine beetle in Montana is the result of a “perfect storm” of factors: mild winters have allowed beetle numbers to skyrocket; the central part of Montana north and south of Helena, with about 80% of the damaged acres, has a high percentage of trees of the right size; and in some forests, lack of management has led to overcrowding, which stresses individual trees. Wood for Haiti has a plan to help the region sail through this “storm” stronger than ever. The question is, will the plan be put into action? Please read the conclusion of the inspiring Wood for Haiti story.